There is something quite refreshing about a historical fiction that doesn't quite read like a historical fiction. I mean it does, but it feels like it is more than that. When there is drama, life, a little admiration and some nice humor thrown into the mix, the history part of the historical fiction doesn't quite overwhelm. As such, it becomes quite interesting and easy to read it. 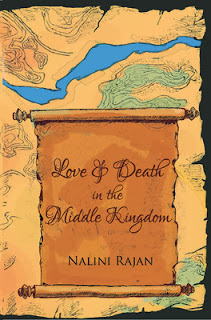 Nalini Rajan's latest offering, her third fiction, is such a novel. Her language, quite fluid flow of events and background work have made this story quite a lovely one. The story of research student Nitya, sent by her professor (who is a renowned person in the field and quite a character), to one of his prodigees Sharat (who's built up quite a reputation himself), to find out the story of a courtier in the Vijayanagar empire, whose diary has surfaced and landed in the hands of Sharat by chance. The story is engaging, not only from the historical perspective, but also in the lives of Nitya and Sharat as they share the story with us, and enter into its depths themselves. The cover is intricately designed, and very alluring. I quite enjoyed this book, and will read it again soon. First Reads Challenge at b00k r3vi3ws.